Personalized Toothpicks Holder Custom Printed in Bulk or Blank. Promotional, Inexpensive. Budget Prices in the USA and Canada. Includes 12 toothpicks. 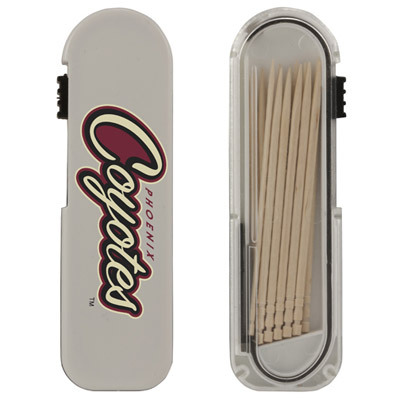 Wholesale advertising Toothpicks Holder on sale. Lowest cost in North America. Free Artwork Design. American Clients pay no taxes. The unit prices below include you full color custom imprint on a decal or your 1-color custom imprint directly on the holder: same price. We also supply blank (not personalized) Toothpicks Holders: see below. Setup Charge: $45.00 for full color decals, or per each direct imprint color. Extra color or location: add $0.25 per color, per side: applies only to direct imprint. PRODUCTION TIME: 3 working days after art approval; Rush production of 1-2 days is available: add 35% for 1-day rush; $30% for 2-day rush. Blank (not personalized) Toothpicks Holders ship next day. Keep your teeth sparkly clean on-the-go with this travel toothpick dispenser. This plastic travel dispenser holds approximately 12 toothpicks and features a thumb-slide mechanism that extracts the toothpick inside. Perfect as a gift at restaurants, dental practices and more! Dispenser includes a one color direct print or optional full color process printing.